IRVINE, Calif.--(BUSINESS WIRE)--CoreLogic® (NYSE: CLGX), a leading global property information, analytics and data-enabled solutions provider, today released data analysis which shows that 232,721 homes along the Texas coast with a reconstruction cost value (RCV) of approximately $39.6 billion are at potential risk of hurricane-driven storm surge damage from Hurricane Harvey, based on Category 3 predictions. Current projections do not expect Hurricane Harvey to exceed a Category 3 storm. 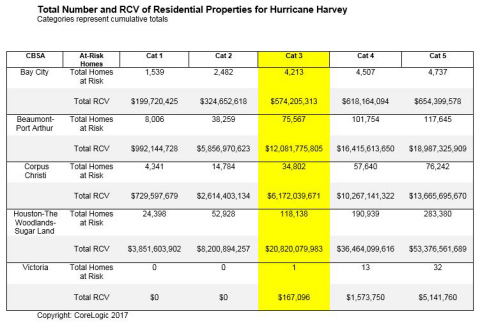 The table below shows the total number of properties at risk of storm surge damage for each of the five hurricane categories as well as the accompanying RCV for the Core Based Statistical Areas (CBSAs) located along the Texas coast that could potentially be affected. The RCV is the cost to completely rebuild a property in case of damage, including labor and materials by geographic location, assuming a worst case scenario at 100-percent destruction. Hurricane-driven storm surge flooding can cause significant property damage when high winds and low pressure cause water to amass inside the storm, releasing a powerful rush over land when the hurricane moves onshore. This CoreLogic analysis measures exposure to damage from storm surge and does not include potential damage from wind and rain associated with hurricanes. CoreLogic analysis of hurricane-driven storm surge damage to Texas coast from Hurricane Harvey, based on Category 3 predictions.